Direct Drive Pumps deliver 4,000 psi. Featuring modular unloader with built-in by-pass system and fixed chemical injector, Series 66DX is designed for direct-drive gas pressure washers and can also serve as jetting pump. Units include 8-bolt forged brass manifold head, oversized connecting rods, concentric solid ceramic plungers, and forged hardened crankshaft. Snap-together, interchangeable 304 SS inlet and discharge valve assemblies facilitate pump servicing. CAT PUMPS introduces the compact, rugged direct-drive 66DX series with modular unloader and built-in By-Pass system. The high quality materials and unique design of the 66DX Series Pumps offer superior reliability and long life at a very affordable price. Designed for easy compact direct-drive gas pressure washers, it serves double-duty as a jetting pump. The 35450 Pulsating Assembly enables quick field retro-fit. o CAT PUMPS specially formulated Hi-Pressure Seals are field proven to last long under high pressure and yield the greatest number of operating hours. o CAT PUMPS field-proven, concentric, high-density, solid ceramic plungers provide extended seal life and better overall pump performance. o V-Packings are reinforced with Male Adapters offering greater endurance under high pressure. o Flange-design permits easy, quick direct-mounting to most gas engines increasing flexibility and compactness. o Compact, modular Pressure Regulating Unloader with built-in bypass and fixed chemical injector is available on each pump for insured reliability. Handle permits precise system pressure setting. o Optional pulsating assembly delivers added cleaning action for pipe cleaning. o Snap together, interchangeable 304SS inlet and discharge Valve Assemblies offer easy pump servicing and minimum parts inventory. o Heavy-duty eight-bolt, reinforced Forged Brass Manifold Head offers exceptional strength and durability. So strong it can be frozen without being damaged. oCrankshaft supported by dual, heavy-duty ball bearings to assure greater bearing load and longer life. 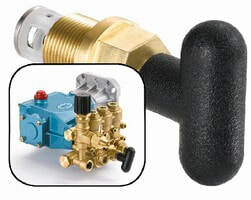 Utilizing SS magnetic valve and corrosion-resistant magnet to hold one inlet valve open, MAG-JET creates pulse-jetting action to power nozzles through tough clogs. Detent allows MAG-JET to be pushed in to correct position to permit magnet to pull and hold inlet valve open for jetting mode, then pulled out to release magnet and allow inlet valve to seat for high-pressure mode. MAG-JET operates at 3-25 gpm and 1,000-4,000 psi. 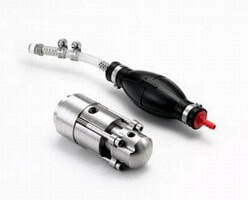 SS magnetic valve and a super strong corrosion resistant magnet to hold one inlet valve open, creating a strong pulse-jetting action to power nozzles through the toughest clogs. Simply push-in the MAG-Jet handle to activate the jetting action. When the MAG-JET holds the valve open, it reduces the pump flow by 1/3, causing the desired pulsations for effective jetting. A special detent allows the MAG-JET to be pushed-in to the correct position to permit the magnet to pull and hold the inlet valve open [jetting mode], then pulled-out to release the magnet and allow the inlet valve to seat [high pressure mode]. This patented concept of holding the valve open, permits the pumping chamber to see liquid at all times and eliminates exposure to extreme vacuum conditions. This means longer seal and pump life! The MAG-JET conveniently mounts into the inlet valve plug making field-retro-fit easy on many CAT PUMPS models including the direct-drive 66DX, high-performance gearbox and larger truck and trailer mount pumps. The MAG-JET works with performances ranging from 3-25 GPM, 1000-4000 PSI. The MAG-JET lets you switch from high pressure cleaning to jetting with ease. Constructed with heavy-duty, 316 cast stainless steel head and valves, model 1541 is suited for pumping harsh and aggressive liquids such as sea water, crude oil, waste-water, DI water, and chemicals. Triplex design lends to energy efficiency as well as smooth, low-pulsation performance, while stacked valve design facilitates servicing. Rated at 18 gpm at 1,100 rpm with pressure up to 1,200 psi, pump weighs 55 lb and may be used in portable or stationary installations. Cat Pumps® has added a new mid-size, stainless steel, corrosion-resistant triplex plunger pump for pumping aggressive liquids. This new 1541 plunger pump features a heavy-duty, 316 cast stainless steel head and valves for strength and corrosion resistance. The 1541 Stainless steel plunger pump is rated at 18 gpm at 1100 rpm with pressure up to 1200 psi. The triplex design of the model 1541 stainless steel plunger pump provides high energy-efficiency and a smooth low pulsation performance. The stacked valve design makes servicing easy. The compact footprint weighs only 55 pounds, making it ideal for either portable or stationary installations. This stainless steel plunger pump is suited to applications pumping harsh liquids such as sea water, crude oil, waste-water, DI water and chemicals. This new pump is available with matching system control valves or as a custom pumping system designed to your specifications. Glycol Dehydration Pumps are built for reliability. 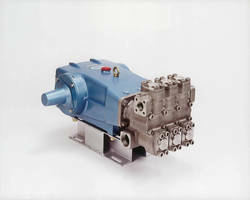 Electric engine-driven TEG pumps are designed to supply triethylene glycol (TEG) for natural gas dehydration systems. Providing continuous-duty performance, pumps are rated for flowrates from 2.3-25 gpm, pressures from 100-2,500 psi, and temperatures up to 240Â°F. Design feature brass or 316 stainless steel liquid-end construction and aids with HAP compliance. Depending on model, drive options include solid shaft, belt, bell, and clutch. Cat Pumps is pleased to announce a new series of glycol pumps specially designed and developed to supply triethylene glycol for natural gas dehydration systems. System reliability, especially the pump, is essential to minimize production interruptions and costly equipment failures. These TEG triglycol pumps have been field proven in the most rigorous dehydration systems and will provide the reliability you demand for this application. DI Water Flushed Pumps are for gas turbine inlet cooling. 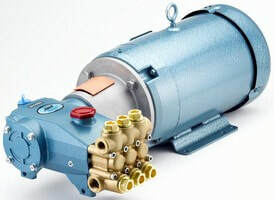 Gas Turbine Inlet Cooling deionized water pumps have ported inlet manifold that permits external flushing between low and high pressure seals. Block-style K models feature forged 316 SSL head that provides close grain structure and fatigue resistance against aggressive DI water, while C models are available with 316 SS cast head. All models include chrome-moly forged crankshaft, high-strength connecting rods, and concentric, high-density, polished, solid ceramic plungers. CAT PUMPS introduces the Gas Turbine Inlet Cooling D.I. water flushed pumps. Both cast manifold and block-style manifold pumps feature a special ported inlet manifold that permits external flushing between the Lo-Pressure and Hi-Pressure Seals. This patent pending application design greatly enhances seal life when pumping the low-lubricity DI water required for this gas turbine fogging application. The special seal flushing extends the seal life beyond the CAT PUMP historic seal longevity. The Stainless steel offers greater resistance to ion pull from the DI water maintaining the purity of the DI water. CAT PUMPS is the exclusive manufacturer of gas turbine inlet cooling DI water flushed pumps. attack of aggressive DI water. These flushed pumps are designed for intense, continuous-duty gas turbine DI water fogging/misting application. All models offer a near maintenance-free operation, energy-efficiency and long-life. o chrome-moly forged crankshaft and the special high-strength connecting rods assure exceptional drive-end performance. Plunger Pump targets seawater desalinization applications. Also suited for chemical injection, Model 6762 Triplex Reciprocating Positive Displacement Plunger Pump features Duplex SS head and valve assemblies. Pump includes concentric, solid ceramic plunger, corrosion-resistant liquid end, and heavy-duty drive end. Operating at up to 50 hp, it handles up to 60 gpm with speed up to 520 rpm, and pressure up to 1,200 psi. CAT PUMPS dependable Nickel Aluminum Bronze Model 6767 and 316 Stainless Steel Model 6761 triplex pumps have delivered exceptional life in seawater desalination systems for many years. The new Model 6762 features both a Duplex Stainless Steel head and valve assemblies providing added corrosion resistance, higher strength and extended life in the more aggressive seawater desalination and chemical injection applications. The secret to the longevity and low maintenance of CAT PUMPS is our high quality materials and uncomplicated design. The new 6762 pump features our special design features and materials common in our entire pump line. Our exclusive seal design and material blend combined with our concentric, solid ceramic plunger offer exceptional seal life. The corrosion resistant liquid-end coupled with the heavy-duty drive-end, assure CAT PUMPS are extremely durable under the continuous-duty demands of applications like seawater desalination and chemical injection. CAT PUMPS are also high efficiency pumps delivering 90% overall efficiency, thereby reducing the energy consumption required to convert from seawater to fresh water or when performing on 24/7 duty cycle. Pumps handle high-temperature and low-lubricity liquids. Available with 316 SS cast head, 35 Frame Flushed Pumps feature porting in inlet manifold that permits external flush between low pressure and high pressure seals, which provides cooling and added lubrication. Pumps include concentric, high-density, solid ceramic plungers, as well as chrome-moly forged crankshaft and high-strength connecting rods. Model 3521C pumps 23 gpm at 2,000 psi, 3531C pumps 36 gpm at 1,200 psi, and 3541C pumps 45 gpm at 1,000 psi. CAT PUMPS has added several new 35 Frame Flushed Pump Models to its line. These Flushed Pumps have proven to significantly enhance seal life and reduce maintenance costs when pumping high temperature and low lubricity liquids. These new C-flushed pump models 3521C, 3531C and 3541C are available with a 316SS cast head offering strength and corrosion resistance. The special porting in the inlet manifold permits an external flush between the Lo-Pressure and Hi-Pressure Seals. This flush provides cooling and added lubrication for the seals. As a side feature, the flushed pumps capture any leaking, that may develop as the seals experience normal wear, in the circulating flushing liquid, avoiding external leaks and assuring a safe work environment. o chrome-moly forged crankshaft and special high-strength connecting rods assure drive-end performance. Pulse Pump suits high pressure chemical applications. Permitting chemical application at system pressures up to 3,000 psi, Model 6350 Pulse Pump directly mounts onto pump head in center inlet valve port of user's high-pressure pump. Inlet line to the unit contains prime bulb to start chemical draw into it. Chemical exits through high-pressure line and is delivered into high-pressure discharge line of primary pump after pressure unloader valve. Pump features corrosion resistant stainless steel construction. CAT PUMPS new 6350 Pulse Pump permits chemical application at system pressures up to 3000 PSI. The new 6350 Pulse Pump conveniently mounts onto the pump head in the center inlet valve port of your high-pressure pump. Several adapters mate the Pulse Pump to our most popular high pressure pump models including the 3FR and 3CP, 5FR and 5CP, 7FR and 7CP and 15 FR pumps. The Pulse Pump is mounted onto the center inlet port of the high-pressure pump and is activated with each stroke of the primary pump. The inlet line to the Pulse Pump contains a prime bulb to start the chemical draw into the Pulse Pump. The chemical exits the Pulse pump through the high-pressure line and is delivered into the high-pressure discharge line of the primary pump after the Pressure Unloader Valve. The high-pressure pump sees no chemical. 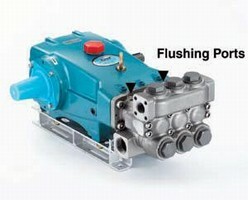 Close-Coupled Plunger Pump has compact, direct-drive design. Capable of delivering 10 gpm, 7CP6110BH103 and 7CP6110BH153 are 10 and 15 hp single-extended shaft motor-pumps, respectively, that operate at pressures to 1,460 and 2,000 psi. Products mount onto motor using bell housing and flexible coupling and are constructed with forged brass manifold and STG V-Packings. Dipstick is included for checking oil level. Applications include coolant flushing systems, dual gun prep units, and multi-gun truck wash systems. 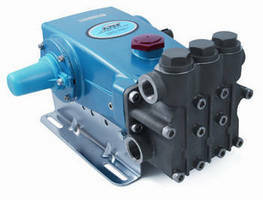 Triplex Plunger Pumps deliver 75 gpm performance. Available as models 6775 (Brass), 6771 (Stainless Steel), 6777 (NAB) to cover various industrial liquid applications, 60 Frame pump series has guided valve design that lends to strength and durability under high-flow operation. Size and weight of each unit facilitate installation, while optional seals and o-rings lend to compatibility and extended life. Matching 316 SS pressure regulator is available for system pressure setting and over-pressure protection. These new 75 GPM models feature a special guided valve design providing added strength and durability under high flow operation. Optional Brass, 316SS or NAB heads for liquid compatibility including fresh water, clean oils, oilfield wastewater and seawater. Matching 316 Stainless Steel Pressure Regulator for system pressure setting and over pressure protection featuring the conical piston design for extended life and only 5% minimum by-pass.